Apple released watchOS 5.1 on Tuesday but removed it just hours later. The company suspended the watchOS 5.1 update after many users complained that the update “bricked” their Series 4 watches. Immediately after Apple released the watchOS 5.1 update, some users took to social platforms like Reddit to complain about the issue they are facing after updating to the latest version. Users said the update “bricks” their Series 4 watches, resulting in an endless boot loop. Affected users say they were able to download the update and start the installation, but the screen freezes after the watch displays the Apple logo, which remains there for hours. The issue appears only with the Apple Watch Series 4 for now, including the Nike+ versions. “I tried updating my s4 to 5.1. After it successfully downloaded the update it started installing. That was almost an hour ago, its [sic] still in the dock and it permantently [sic] shows the apple [sic] logo. Will it come back again? How long can it take?” one Reddit user said. The issue does not affect all Series 4 watches. Some users noted that their Series 4 watch updated without any issue. As of now, it is not clear if the issue is with the watchOS 5.1 update or with certain watch settings. However, Apple has pulled the update as a precaution. The company asked users to contact AppleCare if they are experiencing the issue and says no action is needed if the update is installed successfully. As of now, there is no word from Apple on when it will re-launch watchOS 5.1, but considering how quickly it pulled the update, the updated version should come soon. Apple’s watchOS 5.1 is expected to bring a major update to the fall detection system. After the update, the fall detection system should send recorded messages to emergency services when a fall is detected. The message will include location information like latitude and longitude. Before the update, location information was only sent to a key emergency contact. The recorded audio message will be sent for anyone who falls and is unable to speak. If a user who falls can talk, there is an option to stop the audio message from being sent and speak directly with emergency dispatchers. Apple’s fall detection system has already been credited with saving at least one life. The watchOS 5.1 update also promises support for emoji, group FaceTime audio and updated watch faces. One of the new watch faces is a colored face that will give users a choice of different shades to fill the whole face. The update also brings more than 70 new emoji, which were released with iOS 12.1. There are some bug fixes as well. An issue that prevented users from sending or receiving invitations on Walkie Talkie and another issue related to the installation of the Walkie Talkie app are now fixed. According to the watchOS 5.1 release notes, one other issue in which “some previously warned Activity awards were not showing in the Awards tab of the Activity app for some users” is now fixed. One much-anticipated update is electrocardiogram (ECG, also known as EKG) functionality. Apple promised it would enable the functionality before the end of the year, and many had expected it to come with watchOS 5.1. 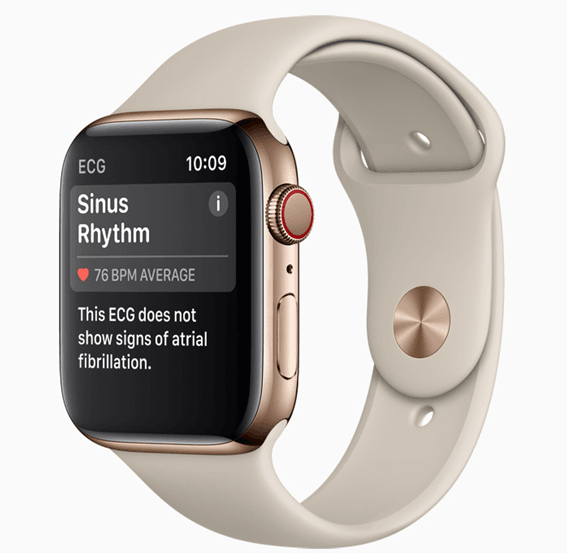 However, the ECG update was not part of watchOS 5.1..
A 34-year-old Swedish man recently credited the Apple Watch with saving his life. The watch came to Gustavo Rodriguez’s rescue after he collapsed near his stove due to crippling back pain, which he described to the Swedish publication Aftonbladet, as feeling like a knife was stuck in his back. He wasn’t able to move after he collapsed, but he noticed that the fall detection on the Apple Watch was tapping his wrist and offering to call emergency services. Although the man decided not to call emergency services, he used the watch to call his mother-in-law, who lived nearby. His iPhone was in another room. His mother-in-law came and turned the stove off, and then Gustavo was taken to the hospital.